The goal of any industrial scale is to determine an accurate weight for items placed on the scale platform. While this goal may be common to all scales, the level to which it is achieved, the method in which it is achieved, the ease of doing so, and the use of the results vary widely from one scale technology to another, from one manufacturer to another and between different scale types. Every weighing application is unique, each one requiring different scale specifications. Accuracy is often the driving parameter. The underlying technology of the scale will define the level of accuracy that may be achieved. By far, the predominate technology used for industrial scales is strain gage load cells. While this type of scale has been available for more than fifty years, it provides sufficient accuracy for the majority of weighing applications. A high quality, well designed strain gage scale can provide overall accuracy specifications of up to 1/10 of 1%. This may be sufficient for most industrial weighing situations. Advantages of this technology include that it is widely available from many scale manufacturers. It is provided in a large variety of form factors including bench scales, parts counting scales, drum scales, platform scales, floor scales and many others. This type of scale is the least expensive, compared to alternative solutions. The traditional solution for higher accuracy requirements has been Magnetic Force Restoration (MFR), also known as Force Motor scales. This technology relies on current flowing through an electromagnetic coil which opposes the weight on the scale platform. Overall accuracy can be ten times better than strain gage scales, although certain temperature performance issues can compromise final results. These scales are offered by a more limited range of producers. They are particularly well suited for low capacity weighing, less so for moderate capacities of up to 25 lb, and become impractical for higher weight ranges. Often, the final determination to bypass this type of scale is due to the cost, which can be multiples of that of strain gage scales. Most recently, a third technology has been developed by Arlyn Scales which offers similar accuracy to MFR scales but at costs that are within range of good strain gage scales. These Ultra Precision scales utilize surface acoustic wave (SAW) transducers to measure extremely small load cell displacements caused by change of weight on the scale platform. Fortunately, these scales are not limited to only small capacities, and are currently available in form factors that include most of those found with strain gage scales. Although the precision level of the scale may be a critical factor, the usage of the scale will determine the nature of the required user interface and presentation of the data. The accuracy of the scale is irrelevant if the scale operators cannot access the weight data that they need in a configuration that is useful for them. 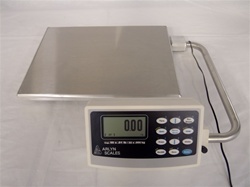 Most industrial scales use a standard digital indicator which typically consists of a number of LED or LCD digits, along with some front panel buttons. Of course the size of the digits is important for ease of viewing. Digit heights of 0.5″ up to 1″ are most common, although some can be as large as 2″. The brightness of the display is also important, depending on ambient lighting conditions. Front panel buttons are a necessary evil. The very simplest indicators may only have three or four buttons, allowing the units of weight to be changed and the weight of a container to be subtracted. Complications begin to arise as soon as additional features are offered. Ideally, each function should have its own button, making it easy to access that function. Some of the more basic indicators attempt that route, but this quickly results in a button layout that is cluttered, confusing and hard to use. Some of the more sophisticated indicators substitute a dot matrix display for the numeric readout. This allows text to be added to the display. With this capability, a menu tree can be used with up and down arrows to scroll through a larger number of functions. Learning to use a system of this type can be frustrating, difficult, and prone to errors. Even with text display, functions such as tare entry, or piece weight, require a full numeric keypad to enter values. Once again, the front panel becomes cluttered with buttons which interferes with user friendliness. If alphanumeric entry is beneficial, such as assigning part names or user ID, the front panel is once again unworkable. In today’s Smartphone environment, a user has very high expectations. They want a very user friendly method of seeing information and entering their choices. The display should be sharp and bright and easy to read. Only the desired information should be shown. Color should be used to clarify, highlight and simplify. The buttons on the screen should be limited to only the function that is being used. When the requested function changes, the set of front panel keys should also change. A numeric keypad should pop up when necessary, and disappear when not needed. Similarly, the same should happen with an alpha keyboard. In other words, it should act like a Smartphone. This type of industrial scale indicator has just been introduced by Arlyn Scales. It incorporates an eye-popping 7″ diagonal color touch screen using a comfortable, familiar Android style user interface. It is packaged in a rugged, stainless steel enclosure. The default weight display consists of 1″ high, block, graphics digits that are extremely easy to read, even at a distance, and even under poor lighting conditions. A scoreboard display may be chosen from the menu, providing 2″ high digits, but using up much more space on the screen. A variety of units of weight may be chosen by the user, including pounds, kilos, grams, ounces, and troy, among others. A matching legend will appear, notifying the user of the unit chosen which will avoid confusion. User setup screens allow the selection of units, as well as other choices, to be limited, further enhancing ease of use. The buttons on the screen will closely correlate to the mode that has been chosen for the scale. Simplicity is compounded with color related functions and on screen keys. When the user enters a menu function, they are able to swipe and flick to get to the menu choices of interest. Familiar radio buttons are provided for selections. The numeric keypad pops up when needed and then disappears after use. A full alpha keyboard appears to allow appropriate entry. In other words, it acts like a Smartphone! This type of familiar look and feel significantly reduces the learning curve. It also enhances efficiency due to the intuitive user environment. Furthermore, it reduces errors in obtaining weight data as it allows the user to concentrate on weighing, instead of concentrating on operating the scale. There are many benefits that an Android style user interface brings to a scale. But the scale itself still needs to have the required accuracy and functions. The Arlyn Android scale offers a wide range of communication options, including USB, RS-232, Bluetooth, Ethernet and Wi-Fi. Weight can be monitored on a PC or in the cloud, and data can be collected. Power can be supplied from a regular outlet, or from its internal, rechargeable lithium ion battery. The scales are available with standard strain gage technology or with Ultra Precision SAW technology. Any way that you look at it, you have a winning combination. Contact us today to learn more!